Buying & Selling Fine Joseph Kleitsch Paintings! The career of Joseph Kleitsch (1882–1931) is often categorized into two parts: his early work as a portraitist in his native Hungary and in Chicago and his impressionist landscapes painted in California during his later years. However, Kleitsch continued to paint figurative works after his move to California in 1920 and was considered the premiere portrait painter in the artist’s haven of Laguna Beach until his untimely death in 1931. The Golden Twenties is the first museum exhibition to assemble Kleitsch’s remarkable portraits and figure paintings. 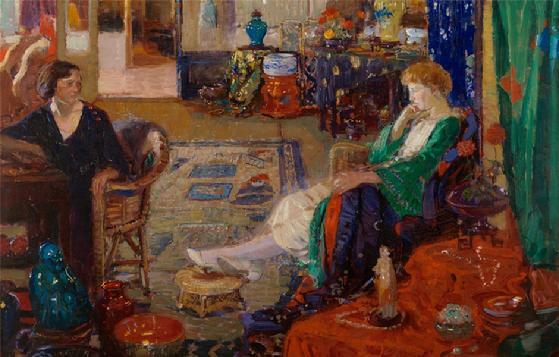 With a jewel-toned palette influenced by his native Hungary and a lighter, golden palette developed after his arrival in California, the works demonstrate the artist’s exceptional ability to reveal the unique personality, demeanor, and essence of each subject.